December 2015 - Although we did not make it to IoT World Forum this month in Dubai, our soon-to-be-released BACnet controller did. 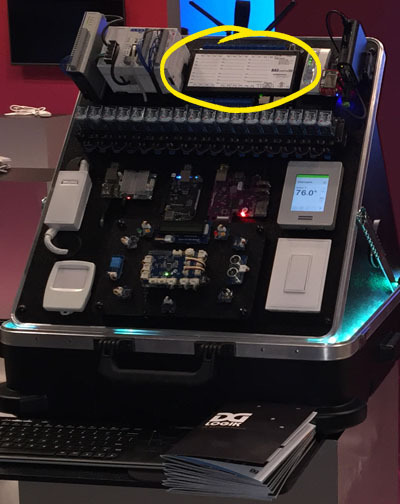 The BAScontrol22 BACnet/IP Sedona Unitary Controller was one of the several controllers included in a demonstration with DGLogik's Internet of Everything (IoE) Application Platform. Being BACnet/IP compliant, the BAScontrol22 with its direct connection to an Ethernet network made it easy to connect to the DGLogik IoE solution showing the value of open systems by the reading and writing of BACnet points over an IP network. In this YouTube video, you can see that DGLogik's IoE platform is driving the BAScontrol22 pretty hard - at a rate not necessarily recommended for real-world applications. Their CEO Eugene Mazo must have wanted to see what happens when you put the "pedal to the floor." According to Eugene, "The BAScontrol22 showed the highest performance and greatest reliability of any controller connected." Eugene spoke at the Startup Showcase. In his presentation on a Modern IoE Application Platform, he said there are three important pillars in an IoE ecosystem. "The first pillar is the ability to connect to and establish a bi-directional communication channel with anything and anyone regardless of origin, manufacturer, protocol or language. Furthermore, do so in a completely open and transparent manner. We live in a world where access to data is becoming a commodity and the democratization of connectivity will lay the foundation for generations to come. This effort must be open source and fully collaborative amongst all IoE participants." Contemporary Controls agrees and sees BACnet as one of those important open system protocols. The BAScontrol22 will be announced at the upcoming AHR Expo. It is part of the BAScontrol Series - a line of BACnet unitary controllers compiling with the B-ASC device profile that support both BACnet/IP and Sedona Framework (SOX) protocols via an Ethernet connection. A resident web server allows controllers to be accessible via a common web browser. Controllers in the series support a common core of features and differ only by I/O count and network connections. According to the IoTWF website, "The Internet of Things World Forum (IoTWF) is an exclusive industry event, hosted by Cisco. The IoTWF is widely recognized as the premier thought leadership forum in this rapidly growing industry, a must-attend event for key stakeholders and innovators in business, government, and academia driving adoption of the IoT worldwide." This was the third world forum that was held. We attended the previous forum held in Chicago and learned how IoT was driving collaboration not only in building automation but in other verticals as well.